Its been a long time, maybe never, that a freshman has been so fast (maybe Grace Tinkey) in recent history. 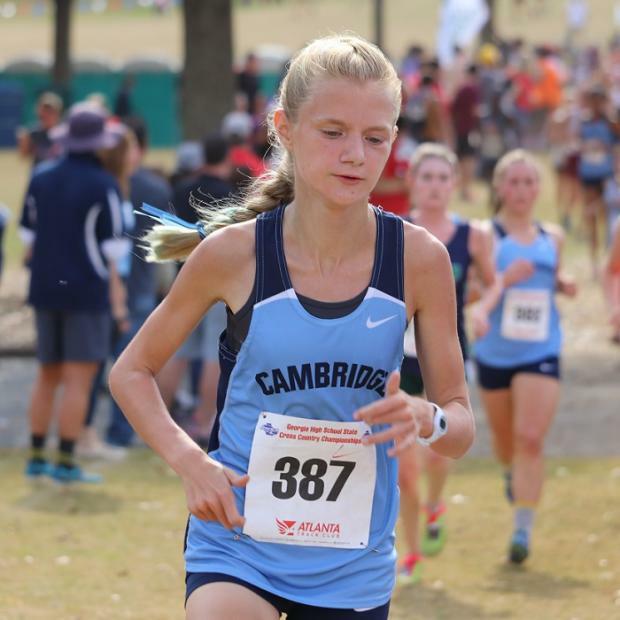 Makena Gates just detroyed everyone her 8th grade year, including down in Bleckley County at MS State Cross Country Championships. 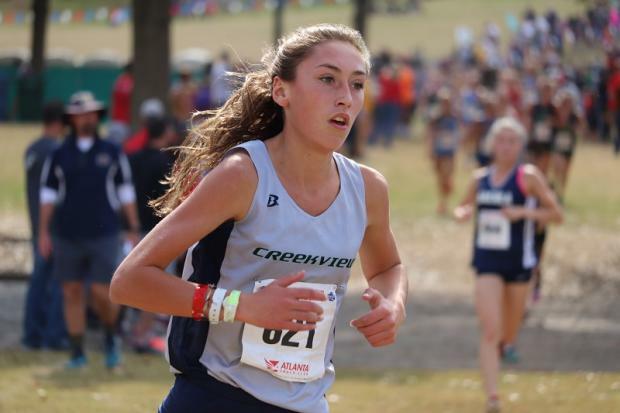 Gates began the season at Creekview playing 2nd fiddle to Nyah Hernandez, but in October found her stride. Gates went out quick Saturday, but found herself trailing Skylar English as they made the turn to begin Loop 2. The next thing we heard on the PA, was she had a a big lead at the 2 Mile mark, and won going away posting a 18:58. 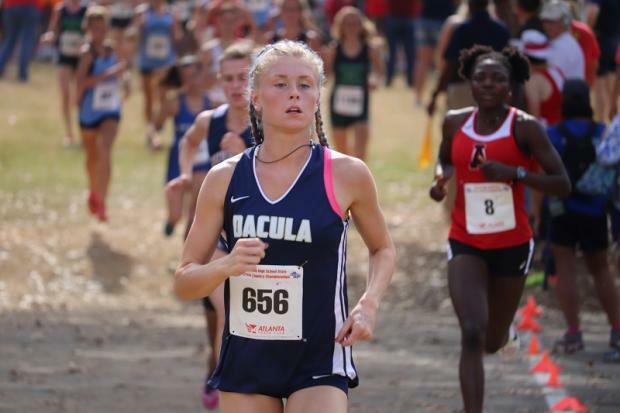 Allison Rothrock of Johns Creek was the sole runner making the top 10 individuals not on a Podium squad at 9th place in 20:32, leading the Glads to 5th as a team. 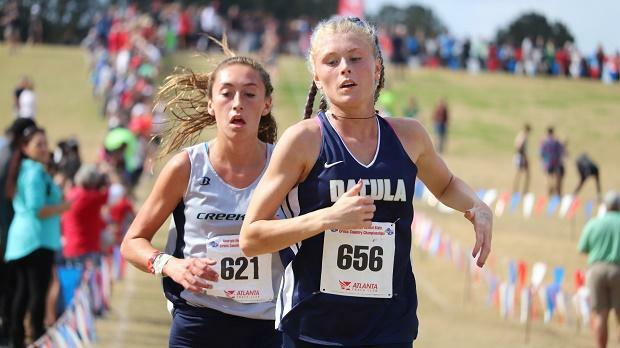 AAAAAA Overall Runnerup, Skylar English of Dacula, chases the young Creekview duo ahead. Although a 800m specialist, Brenda Ayuk of Alexander was 3rd Overall. 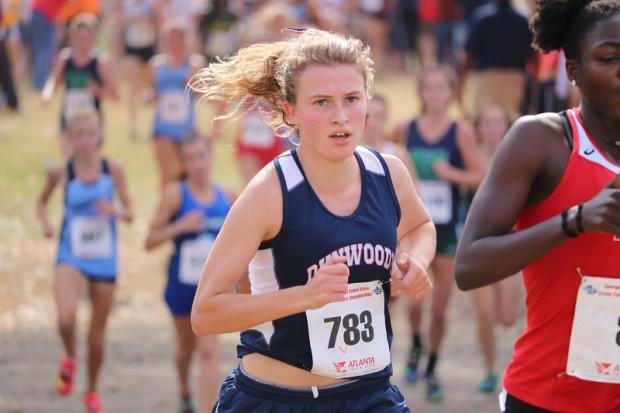 Samantha Cameron of Dunwoody used her experience to corral a 6th place finish. English of Dacula and Gates begin Loop 2 with a huge gap on the chase pack. Delaney Goodell placed 7th leading the Bears to their 1st XC State title. Cambridge wasn't done yet at Carrollton Saturday. The #3 ranked Region 7 champs Girls team, had business to attend to. They must have drawn some inspiration from seeing their Boys squad rise to the occasion, and took it upon themselves to do the same. 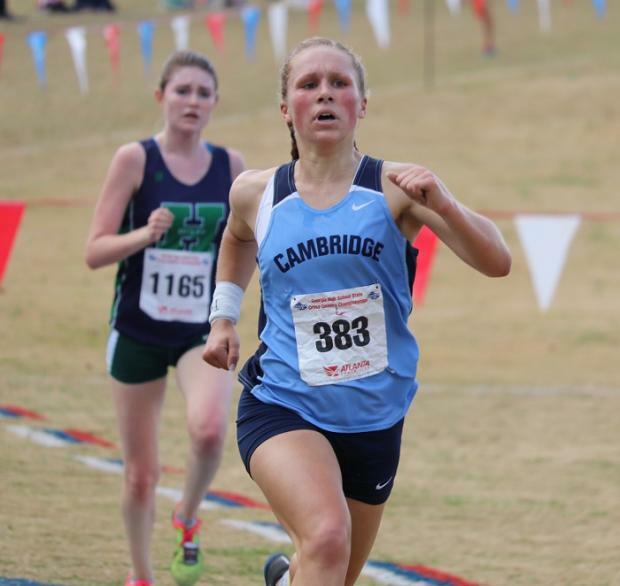 Soph Ashley Sechrest set the pace early for Cambridge, and finished 19th. Their top runner did their thing, as Delaney Goodell placed 7th at 20:23. 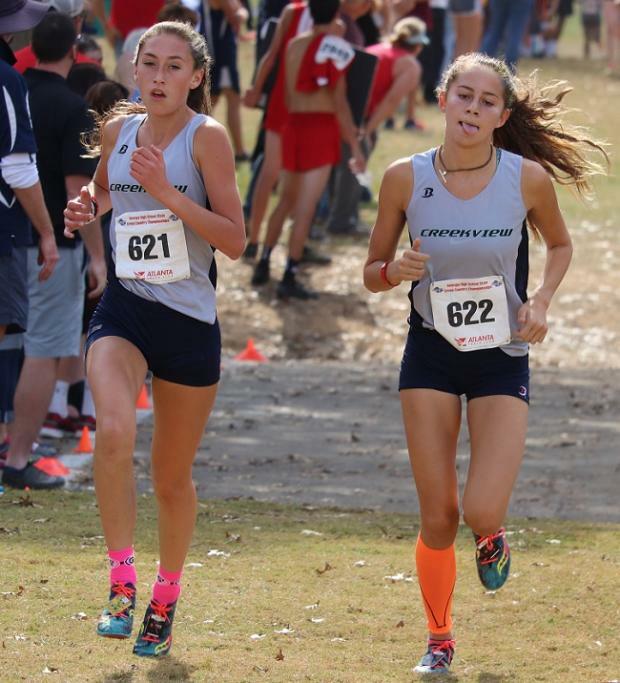 But the key to victory were their 2-5, as they swept the 10-12 spots, including: Lilly Eltson (10th- 20:51), Troyce Grant (11th-20:53) and Chloe Phelps (12th-20:53 and change) Slamming the door on any further challenge, was soph Ashley Sechrest, who was in the chase pack early and held on for 20th overall in 21:23. Makena Gates (L) and Nyah Hernandez of Creekview took the race out quickly. Creekview was a slim favorite to win the team title pre-race having bested Harrison by a point at Region. But, at State strange things can occur on those hills.. Gates was dominant winning the Overall race and Hernandez 4th. But, their depth was a factor, as Cambridge just ran better on this day from 3-5 having to settle for a 2nd place Podium spot. 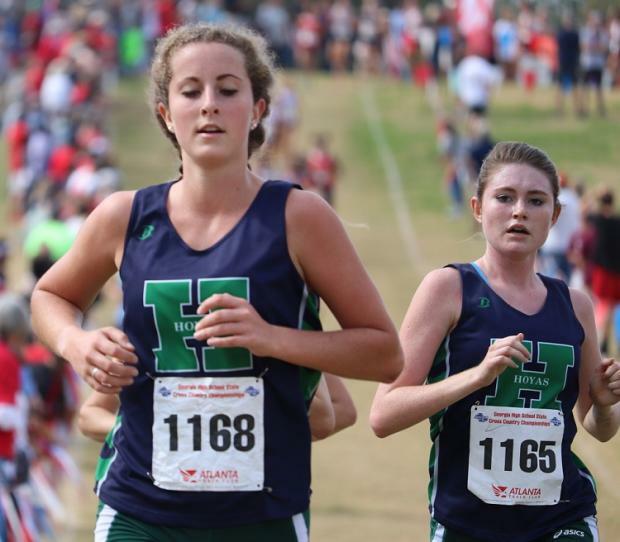 Kira Stanley and Kayli Moody of Harrison work in tandem resulting in All-State honors. No one should ever count out an Alexander squad coached by Brian Robinson. After their Boys squad earned a Podium spot, well, their Girls felt compelled to pull off the same trick. 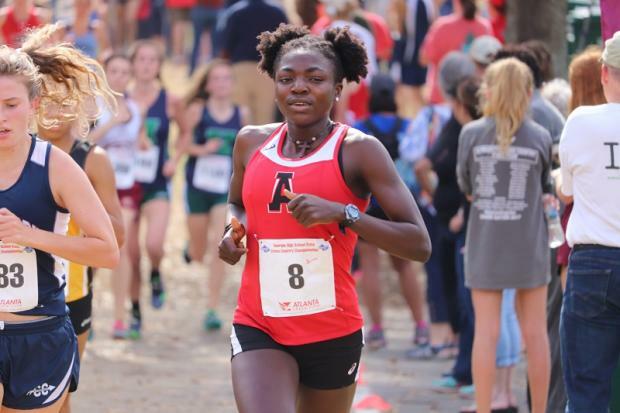 The Lady Cougars finished a strong 4th as a team, led by their ace Brenda Ayuk who motored to 3rd Overall at 19:42 overtaking Nyah Hernandez just before the finish.